With an increase in speed and frequency of vessels, the chance of cetaceans being struck increases. All cetaceans, no matter what sizes they are, can be struck by high speed vessels, hence resulting in serious or even fatal injuries. Most reports of collision involve larger animals as they are easier to be noticed. Some of the dead bodies were even brought into coastal waters or even the port at the bow of the ship. Collision of smaller species usually got unnoticed after the strike as the dead bodies can be washed away soon. 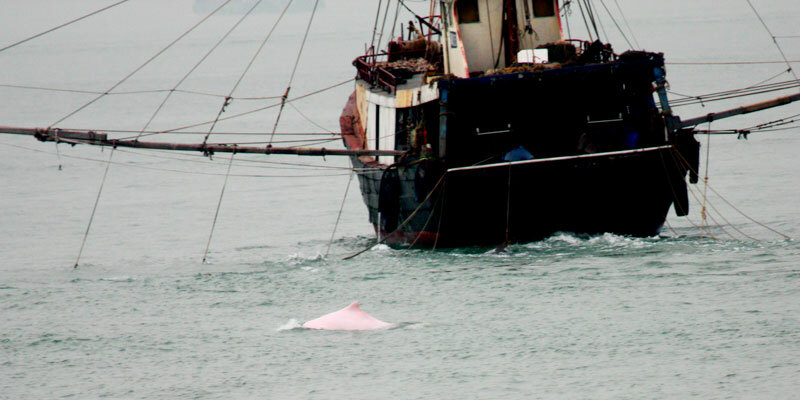 The collision between cetaceans and vessels not only do harm to the animals, but may also damage the vessel involved and hence giving rise to accidents. 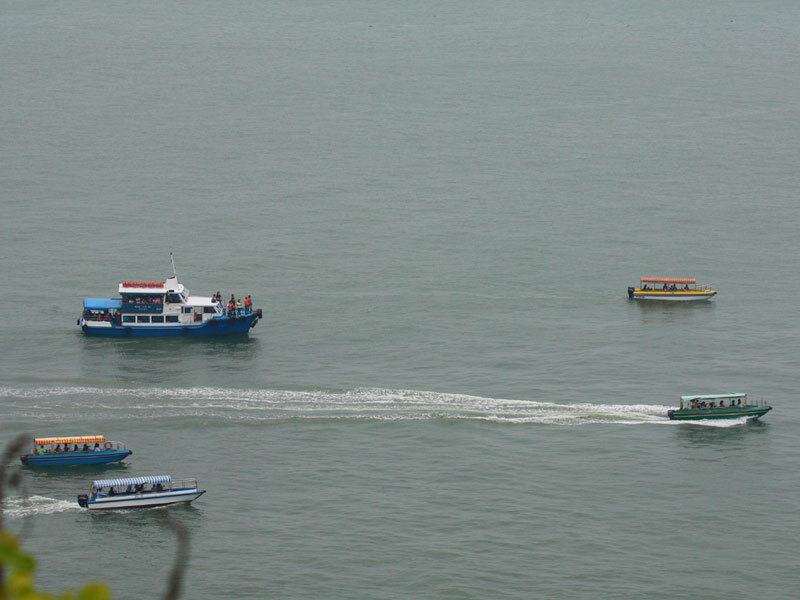 Vessel collision seems to affect the individual animal concerned, but it is not as simple as that. If the frequency of collision is high, resulting in high number of deaths of a certain species, the sustainability of the population will be affected severely. For instance, the mortality of the North Atlantic right whale whose main habitat is the busy waters off the east coast of the USA and Canada is particularly high. It is thought that mortality due to collision may make the difference between extinction and survival for this species. In the Mediterranean, there are also concerns about the high collision rates for the population of fin whales. The Whales and Dolphins Conservation Society estimated that up to 300,000 whales, dolphins or porpoises are killed in fishing nets worldwide each year. A newly released report, Shrouded by the Sea, which is based on a new investigation by a research group at the University of Bristol, UK, reveals the harrowing truth of how whales and dolphins slowly meet their painful death in fishing nets. The suffering of these animals in commercial fish production is contrasted with the welfare standards widely adopted for animals in commercial meat production, drawing the conclusion that this degree of suffering would not be tolerated if it occurred on land. Most dolphins trapped underwater by fishing gear die of asphyxiation. While the time it takes for the animals to die in this way varies, it is likely that many are subjected to a longer period of suffering than would be considered morally acceptable. The damage seen on bycaught animals shows that many of them struggle desperately to escape from their entrapment, sustaining horrific injuries in the process. The severe injuries regularly seen in bycaught whales and dolphins are evidence of the suffering victims go through. Rope and netting often cause cuts and abrasions to the skin, tightening as the animal struggles and cutting deeper into the flesh. In extreme cases, fins and tail flukes can be totally or partially amputated by the tightening nets. Bodies of bycaught dolphins are commonly recorded as having broken teeth, beaks or jaws and extreme internal injuries. Large whales that become entangled in fishing gear have been found with severe lacerations deep into their blubber and even into their bones. As these animals are powerful enough to swim away and pull the gear with them, the rope continues to tighten and cut into their body over time, often resulting in a slow and painful death. WDCS is calling for governments and regulatory bodies to act urgently and decisively to end this unacceptable suffering of whales and dolphins. This will require changes to the way fish are caught and even closure of fisheries where there is no effective or practicable way of preventing the incidental capture of whales and dolphins. Whale or dolphin watching activities are getting more and more popular and this brings in economic benefits to the local tourism industry. 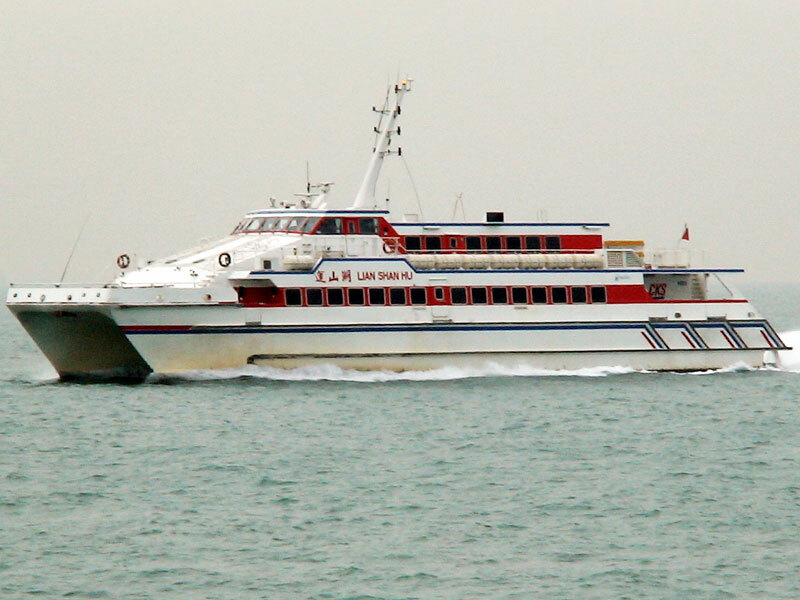 As it is profitable to run whale watching tours, the whales or dolphins in the area can be severely disturbed if the operators are not regulated. In that case, if given other options, the whales or dolphins will just leave the area where they are disturbed. The whale watching industry will then become unsustainable. In some places, skippers approach dolphins at high speed and sail right through the pod, hence creating great disturbances to the dolphins. Some skippers also identify the species incorrectly and they do not know much about their behaviour. This makes whale watching activities lose its educational value. The ability to hear well is vital in all key aspects of dolphins’ lives including finding food, navigating and social interactions. Any reduction in hearing ability – whether by physical damage or masking by other sound – may seriously compromise the well being of individuals and, therefore, populations. Manmade noise pollution comes from shipping and other vessels, military activities, fisheries anti-predation devices, ocean research, and the air-guns used in seismic testing to find oil and gas deposits. Whilst many of the sources of introduced noise are localized, some recent military technologies have utilized powerful detection mechanisms that may radiate over thousands of kilometres of the ocean. Potential impacts of human-created noise on dolphins range from physical damage to these animals (especially to those in close proximity to the noise source) to altering behaviour, increasing stress and displacement from important habitats. The impact of greatest consequence associated with noise pollution, harassment and ship strikes may be the cumulative and long-term impact that we are currently unable to assess and evaluate. Marine pollution has profound effect on toothed whales, which are at the uppermost of the marine food web. Although dolphins mainly absorb water through the consumption of fish, and they seldom intake large volume of sea water, the high dosage of pollutants (including heavy metal and organochlorines) accumulated up the marine food web will dampen their reproductive and immune system through the intake of fish as dolphins are at the uppermost of the marine food web. Scientists found high concentration of carcinogens (e.g. DDT, PCB, dioxins, etc.) in the tissues of dead dolphins through toxicology tests. 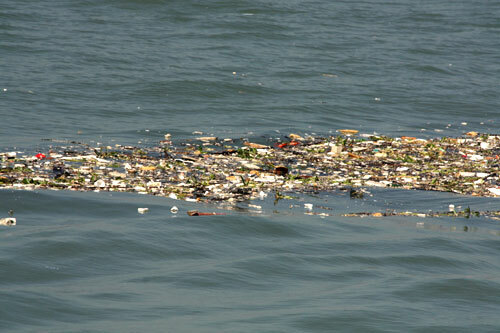 Apart from marine pollution, rubbish floating on the sea also poses risks to dolphins. Some rubbish look edible to the dolphins. If they eat the rubbish, they can be choked to death. It is important to both the individual and the survival of the dolphin population that habitats continue to be suitable to support them. Coastal development projects will damage the dolphin habitat and displace the dolphins to other places for the initial activities (feeding, socializing, nurturing their young or mating, etc.). The modification of habitats may cause shifts in dolphin food sources (through change in upwelling patterns and prey aggregation). Species that have evolved to find food in a highly patchy environment may have difficulties securing prey. When considered in the context of cumulative impacts, the ability of dolphin populations to adapt to this rapid change may be compromised. In 1986, the International Whaling Commission (IWC) enacted a moratorium on all commercial whaling. Since then, three nations - Iceland, Norway, and Japan - have slaughtered over 25,000 whales (over 2000 whales each year) under the guise of scientific research and for commercial purposes. Yet, the IWC does not have the capacity to enforce the moratorium. 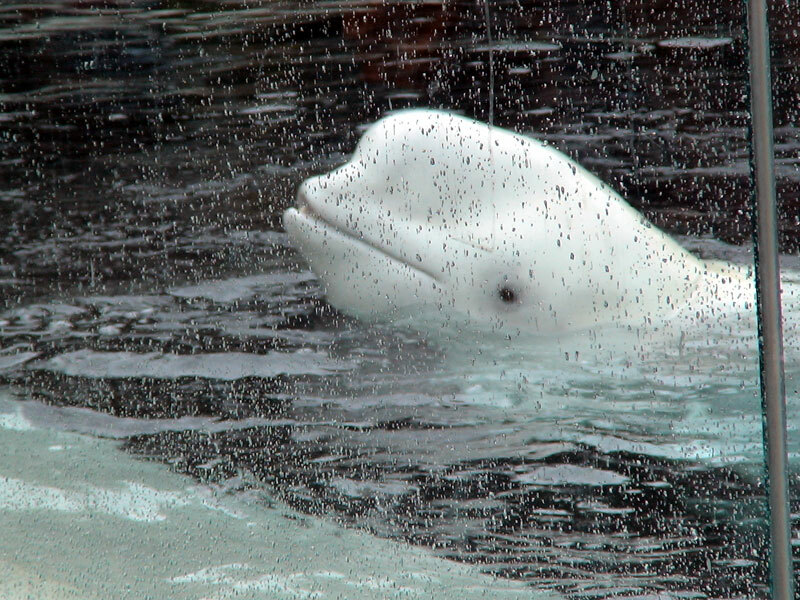 Japan, Norway and Iceland are expanding their international trade in whale products. In the summer of 2009, Iceland’s whalers have undertaken the biggest fin whale hunt in the North Atlantic in more than 20 years, killing 125 fin whales and more than 80 minke whales. With almost no domestic market for whale meat, Iceland plans to export thousands of tonnes of meat to Japan. Pressure is mounting for the ban to be lifted. Norway, Iceland and Japan are not the only countries voting in favour of whaling at the IWC. For years, Japan has been recruiting countries with no obvious interest in whaling to join the IWC and vote in its favour, using development aid as an incentive. In addition, many countries that were once firmly opposed to commercial whaling have felt pressured by Japan’s ever expanding whale hunts to make a compromise that will be dangerous for whale conservation. Whaling is cruel, unsustainable and unnecessary. Not only would whaling bring the population concerned to the brink of extinction, the whale being caught also suffered a long and painful death. It is simply impossible to have a humane way to kill a whale at sea. According to Sea Shepherd, countries that continue with their whaling practice include: Japan, Norway, Iceland, Danish Faeroe Island, St. Lucia, St. Vincent & the Grenadines. Fishermen have killed small cetaceans around the coastlines of Japan for centuries. Currently, over 20,000 of these animals are killed in Japan every year. The species targeted by these hunts include Dall's porpoises, Risso's dolphins, bottlenose dolphins, short-finned pilot whales, striped dolphins, spotted dolphins, false killer whales and Baird's beaked whales. In the last 20 years, over 400,000 small cetaceans have been killed in Japanese waters. One particularly controversial form of these hunts is the “drive hunt”, in which dolphins and small whales are corralled by boats and driven, sometimes by their hundreds, into shallow water where they are killed for their meat and blubber. Not all the dolphins are killed, however. A growing and disturbing trend has surfaced that links the thriving aquarium industry to this archaic practice. 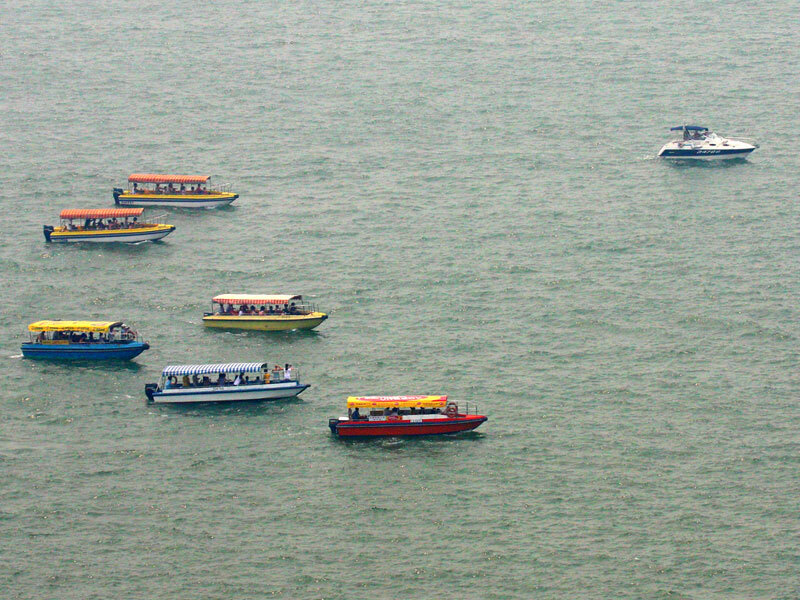 Instead of driving dolphins to their death for human consumption and fertilizer, or as a means of what might be described as “pest control”, resulting from claims that dolphins significantly compete for fish with fisherman, fishing cooperatives are collaborating with national and international aquaria and marine amusement parks to select dolphins from these hunts for public display and human-dolphin interaction programmes. This description of a typical drive hunt does not convey the trauma experienced by the dolphins caught in these round-ups. After being driven into shallow coves, the fishermen kill the dolphins with crude methods, cutting their throats or stabbing them with spears. Unconsciousness and death are not always immediate, and some dolphins take many minutes to die, thrashing about violently as blood pours from their wounds. 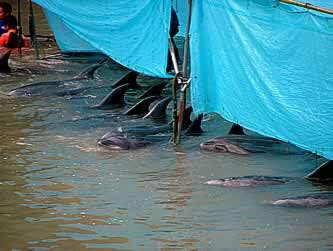 Some of the dolphins suffocate during the round-up and slaughter, getting caught in the nets, weakened and unable to swim from the shock and stress of capture. Many dolphins panic and crash into nets, boats, pier walls and each other. As a result of this struggle, the water turns red with the blood of the dying dolphins. Sometimes the whole drive hunt process can take days, with the animals trapped and frightened, their fate unknown to them. Currently, drive hunts are conducted at Futo, in Shizuoka Prefecture and Taiji, in Wakayama Prefecture. The hunting season in Futo runs from September 1 to March 31 of the following year. The hunt in Taiji runs from October 1 to April 30 of the following year. 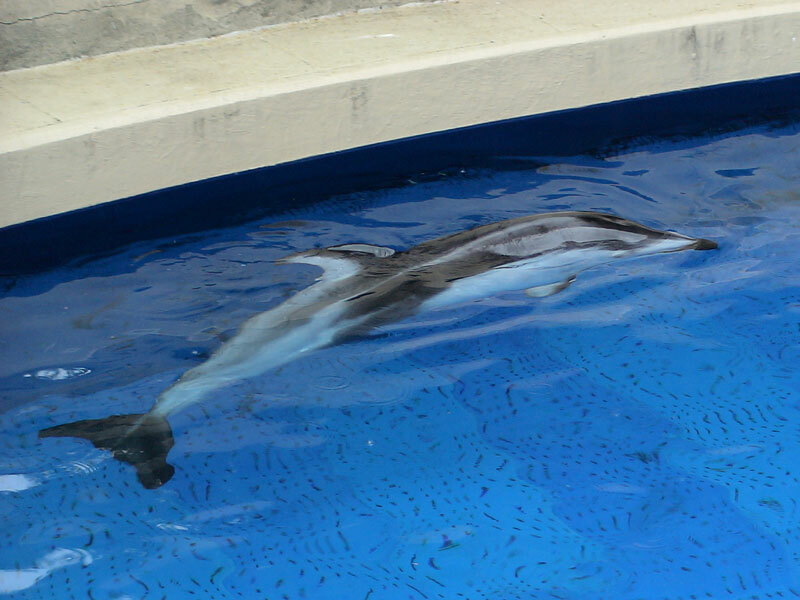 Despite intense international criticism of the inhumane methods of slaughter employed, and as Japanese prefectures appeared to be on the verge of abandoning the hunts, the demand for live animals to supply a growing number of marine parks and aquaria is emerging as a primary motivating factor for the drive hunts to continue in Japan. The cooperation between the aquarium industry and the drive hunts is a devastating development for Japan's dolphins. Neither the demand for dolphin meat nor “pest control” can explain the persistence of drive hunts in Japan today. In fact, evidence suggests that it is the demand for live dolphins from a growing number of marine parks and aquaria that is now underpinning the continued slaughter of dolphins in Japan's drive hunts. When you watch dolphin shows at aquariums, have you ever thought of where do the dolphins come from? In fact, only a small portion of captive dolphins are bred by artificial insemination and a large portion of them are caught from the wild. 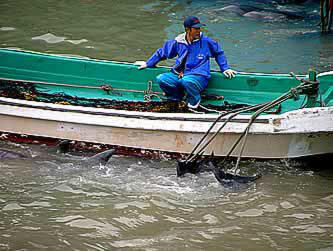 The capturing process of dolphins is extremely cruel and many of them are killed for no reason. Those staying alive will have to live in the tiny “prison” of the aquarium, being kept away from the vast ocean and their friends and relatives. They have no choice but to perform tricks or to have close contact with humans to make a living. If you were a captive dolphin, would you consider this as the kind of life you want to live? Some irresponsible mass media occasionally publish or broadcast wrong information that will do harm to whales and dolphins. In late March 2009, ATV of Hong Kong broadcast a trailer featuring the programme hostess enjoying the consumption of whale meat in Japan. This indirectly promoted whale meat consumption. To set aside the subjective factor of whether you like cetaceans or not, eating whale meat is hazardous to health. Many scientists (including Japanese scientists) had concluded that whale / dolphin meat contains high concentration of heavy metal and organochlorines from marine pollution, making the meat not suitable for human consumption. Whales and dolphins had to rely on the buoyancy of water to support their weight. Hence, they are put under great pressure in shallow waters. If they cannot get back to deeper water on time, their internal organs will be damaged due to gravity and this may be fatal to them. If somebody sit on a whale in shallow water and add to the weight, the whale will have to bear extra pain. What makes it more disgusting is that, the model was sitting on a stranded whale posing happily. This act may make the general public who may be ignorant think that there is nothing wrong with such act. If the general public follow suit in case of a whale stranding incident, the stranded whale may not get the right treatment and may need to bear unnecessary pain because of this. 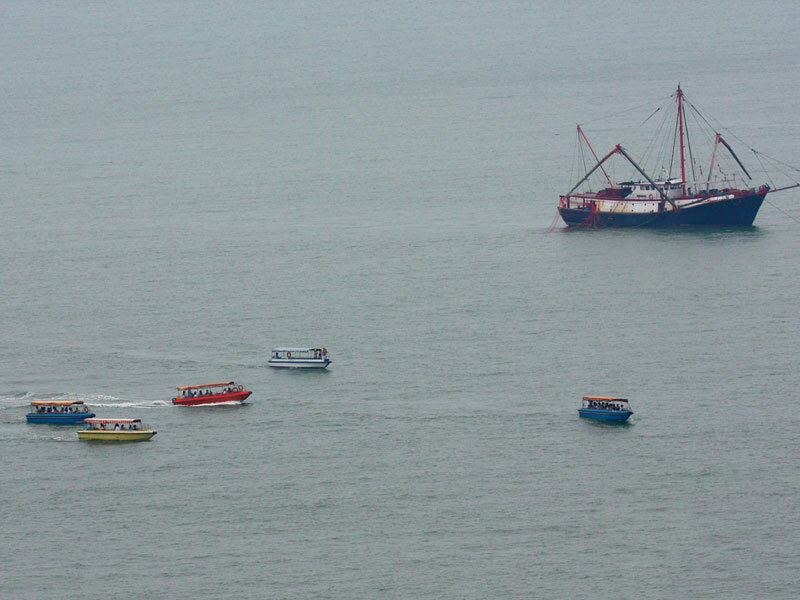 Threats faced by dolphins of Hong Kong: Vessel collision, fishery bycatch, disturbance from whale watching boats, underwater noise, marine pollution, loss of habitat, etc.